Collective Impact is a way for large, diverse groups of stakeholders to come together to tackle large, complicated problems. The Ontario Trillium Foundation funds such work through its Collective Impact Grants (click on the Trillium logo to view a brief overview video). Phase 1 of the Collective Impact process involved focusing on a specific problem and working with a large, multi-stakeholder group to develop a Theory of Change to address this problem. Phase 2 involves building a leadership team and refining the Theory of Change to allow for concrete action to be taken. Phase 1 is Now Complete! All documents, including final reports, Theory of Change document, and stakeholder engagement map have been submitted to the Ontario Trillium Foundation. We are currently in Phase 2. After extensive consultations, a stakeholder group and the steering committee decided that the ultimate goal of Phase 1 should be helping Ottawa achieve its Greenhouse Gas Reduction targets by focusing on greening the building stock of the city, with a special focus on retrofits to existing buildings. Buildings were selected because maintaining comfortable indoor environments accounts for roughly 40% of energy used in Ottawa, existing building stock is likely to persist for many decades, and there are good current technologies or retrofitting existing buildings and creating new buildings at carbon-zero standards. This work also complements existing work going on though the City of Ottawa’s Energy Evolution process, and anticipated work to come out of recently announced federal funding for the Low Carbon Cities Canada (LC3) project. Several basic documents, including a state of the city report, problem statement, and draft theory of change, were produced during Phase 1. They are all posted below. How is Sustainable Eastern Ontario Involved? 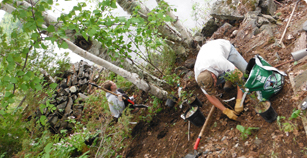 Together with Ecology Ottawa and Maison Tucker House, we received Phase 1 funding for a Collective Impact process from the Ontario Trillium Foundation. We created and continue to manage a steering committee for this project, which includes members from the Ottawa chapter of the Canada Green Building Council, EnviroCentre, the Sustainable Enterprise Alliance, the Nobel Women’s Initiative and the other grant recipients. 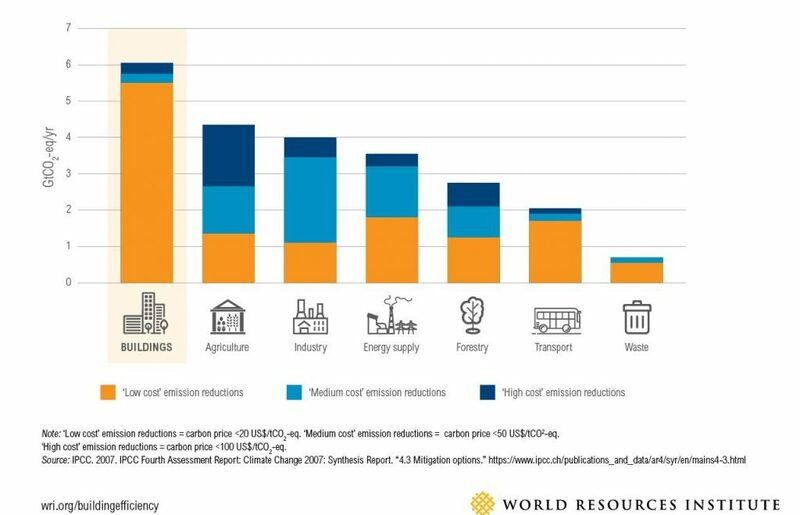 This graph from the World Resources Institute demonstrates the huge potential for effective GHG reduction using existing building technologies, relative to other areas of impact (orange bars). There have been two large community consultation events as part of this process. On May 31st, a group of over fifty organizations from a variety of sectors met to learn about the current state of the City of Ottawa, current opportunities around greening buildings, and to review and refine the Problem Statement that would form the basis of the Theory of Change. On October 4th, a smaller but more focused group met to review the high level goals and begin work on the Theory of Change. Materials presented and discussed at each of these events are available on the event pages linked above. Between these meetings, the steering committee and smaller core groups have met to do more detailed background work to facilitate the large group meetings. The most recent session, to refine the Theory of Change for submission to the Ontario Trillium Foundation and brainstorm next steps for the project, took place on November 10th, and included feedback from steering committee members and core collaborators.